Most teens (and many adults) struggle with understanding personal revelation. It’s one of those tricky topics that can actually make us feel inadequate and disconnected from our Father in Heaven, rather than closer. This teaching tip focuses on helping teens understand what the Holy Ghost prompts us to do/become…rather than just how it feels. The quote about fleeting thought is from President Eyring’s April 2016 Conference Address, Trust in That Spirit Which Leadeth to Do Good. It’s a beautiful address and you should hear every word of it! Here’s the link to the full talk. The quote I refer to is listed below. “The Lord said, “And now, verily, verily, I say unto thee, put your trust in that Spirit which leadeth to do good—yea, to do justly, to walk humbly, to judge righteously; and this is my Spirit” (D&C 11:12). 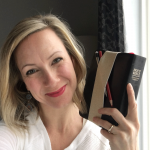 This entry was posted in Gospel Doctrine, Scriptures, Seminary, Teaching Tips, Young Women Come Follow me, Youth and tagged Come Follow Me, Maria Eckersley, May 2017, meckmom, Scripture Study, Teaching Teens, Teaching Tips on May 3, 2017 by Maria Eckersley.